Alison Ackensil, a young paediatrician and cancer specialist, works day and night to save the little Jérémy’s life. Hoping to cure him, she steals some Astrate 211 in a nuclear laboratory and injects it in his blood. But, this robbery will have unexpected consequences. Alison has morbid dreams and is accused of crimes she did not commit. Is she becoming mad? Are the secret services after her by mistake? No, it is far worse…. Thriller-lovers will certainly enjoy this extraordinary led intrigue as En proie au temps is a brilliantly structured story with a though-provoking and breath-taking plot. This techno-thriller, a new hybrid literary genre, blurs the lines between the thriller genre, sciences fiction and fantasy. It is a real page-turner and one cannot put the book down. The book was voted "Summer's Best Thriller" by the French women's magazine, Femmes Actuelle and was in the line-up for the final round in the Serre Chevalier plume de glace's competition in 2012. 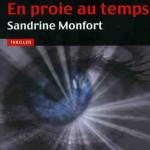 En proie au temps will guide you through the wonders of techno-thrillers, blending science, philosophy and suspense. This brilliant 300 pages thriller, published by Les Nouveaux Auteurs, is available at the French bookshops or on online. For further information about Sandrine Monfort, please check this website.